The Virgin STRIVE Challenge, a mass-participatory ultra-endurance fundraising event organised by Sam Branson and Big Change, was officially launched today on Up at The O2. 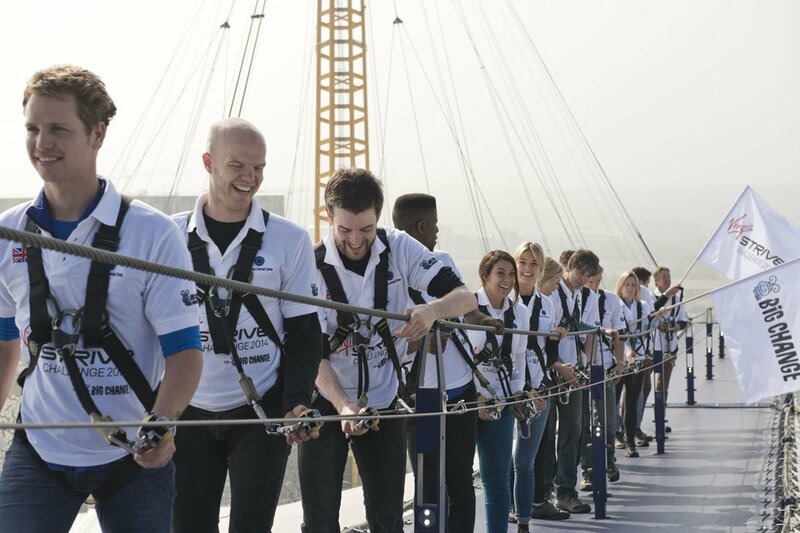 On the roof of The O2, Big Change co-founder Sam Branson was joined by a host of inspirational friends and family including sister Holly, comedian Jack Whitehall, tennis star Marion Bartoli and other high profile individuals taking part in the event. The Challenge, which will take place from August 7th to September 6th 2014, will see a core team of people travel from The O2 in London to the summit of the Matterhorn in Switzerland, entirely under human power. They will run from London to Dover in three back-to-back marathons, row the English Channel, cycle 900+km to Verbier in Switzerland, hike seven days across the Alps (The Haute Route) to Zermatt and finish by climbing the Matterhorn. The core team consists of Sam Branson, Richard Reed (Innocent Co-Founder), Marion Bartoli (Wimbledon Champion), Karl Lokko (poet and social activist), Ade Adepitan (broadcaster and paralympian), Justin Packshaw (adventurer), Fiona Waller (trans-Atlantic and Indian ocean rower), Arnaud Haines and Noah Devereux (event co-founder and director). 350 extra participants will join the Core Team across the various legs including Richard Branson, Holly Branson, Princess Beatrice, Jamie Oliver, Jack Whitehall, Professor Brian Cox, Lawrence Dallaglio, Jermaine Jackman, Jack and Finn Harries, Jamal Edwards, Ed Sheeran and Kenton Cool. Boris Becker will also provide some commentary! I am incredibly excited to have created such a challenging event that will hopefully have such a positive impact on young people across the UK. It has been so rewarding seeing it evolve from an idea with my cousin into a massive and very real physical event that will cross three countries, five different sporting disciplines and contain over three hundred and fifty participants. Go over to the Virgin STRIVE Challenge website to find out how to take part in what is sure to be an amazing adventure and supports a fantastic cause. Read Sam Branson’s blog on how adventure can help develop skills for a successful life.